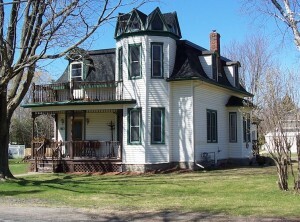 This property situated at the corner of Strachan St. and Lennox St. has connections with several well-known families in both Richmond and Goulbourn Township. The Lyon, Shillington, Gemmill, Phillips, Rielly and Brown families have all owned the land. It has also been the site of not only the unique house which still graces the corner, but also, in an earlier era, a butcher shop, a bakery and a store. Captain George Lyon received the patent deed for this property (officially lot 9 west side Lennox St.) in 1845. An original Richmond settler, Capt. Lyon owned the first mills and store. In 1818, he had been granted a huge estate in the southwest corner of the village but continued to buy and sell large amounts of land in the area. It is interesting that he should receive the deed at such a late date in the village’s development because it was a period when Captain Lyon was experiencing financial difficulties. At any rate, Captain Lyon owned the Strachan St. property until his death in 1851. It is not known if there were any buildings on the site at that time. The executors of the Lyon Estate sold the lot to William Shillington (Shellington) in 1854. Both the 1861 and 1871 census record Mr. Shillington as a merchant and the 1863 Walling Map labels this location as “store William Shillington”. City Directories are more specific. In the mid 1860’s William Shellington is listed as a commission merchant (a merchant who sells merchandise, usually commodities, and earns a percentage of the selling price). Then he appears to have slightly changed the focus of his business. In the Hunter Rose City of Ottawa Directory of Ottawa in 1871, he is listed as a baker and the Lovell’s Directory of the same year calls him a baker & butcher. Records indicate the Gemmill family owned the property from 1889-1898. Robert Gemmill, a former Goulbourn farmer, lived here with his wife, Christina, and children. Robert Gemmill was a “flour miller” while he lived in the village. In 1895, Christina died and the property was transferred to a son, Archibald, who owned it for the next three years before moving to western Canada. William Phillips owned the property from 1898-1907. The Eastern Ontario Gazetteer & Directory for 1898-99 lists a Richmond carpenter W.N. Phillips but no other information about his connection to the village could be found. The present house was possibly built at this time. John Rielly (Reilly) and his family owned the house from 1907-1919. John, a son of Edward Rielly who built the Rielly House Hotel seems to have maintained close business ties with his father and brother, Hugh. It appears that in his early years he looked after the family’s farming interests while Hugh concentrated on the hotel business. By the mid 1870’s, John Rielly was helping Hugh at the hotel, but by the end of the century he is listed in the Eastern Ontario Gazetteer & Directory under the heading “agricultural implements”. At this time (1895) he also served as village clerk and wrote a short account of Richmond’s early history (a copy of this document may be found in the files of the Goulbourn Township Historical Society). John Rielly and his wife, Harriet, had several children but his son Clarence recently gained prominence in local newspapers when the Goulbourn Museum purchased his medals from the World Wars. 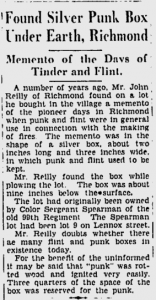 John Rielly moved to Ottawa in 1920 and 12 years later, he provided the Ottawa Citizen with an interesting tale about an artifact he had found on the property. The tale as recounted is provided at the left although at this time we can find no evidence to corroborate Mr. Rielly’s assertion that Andrew Spearman actually owned the land or lived at this location. Robert E. Brown (1874-1949) purchased the property in 1920 and owned the house until his death. He was a native of Richmond and a prominent village merchant for 53 years. He operated Brown Brothers Store – first at 3550 McBean St. and then across Strachan Street at 3556 McBean St. Mr. Brown was a long time school trustee and Chairman of the Public School Board. He was an active member of St Paul’s United Church and Superintendent of its Sunday school. 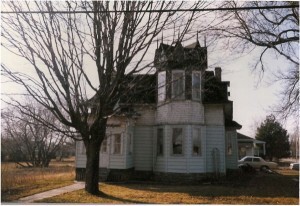 After the death of Robert Brown, the house was inhabited by two other Brown families the first being that of Leonard Brown, a retired farmer, who owned the property from 1950-1980. The second was another retired area farmer, Colin Brown, who lived here until his death and whose widow, Pauline, continued to occupy the house until 2000. During this time restorations were made to both the interior and exterior of the building. This house was constructed (probably in the late 1890’s) in the spirit of the Second Empire style, which is rare in Richmond and Goulbourn Township. Characteristics of this style are the mansard roof on all sides of the original building and the two-storey bay window in the front. The bay window is five-sided and topped by an octagon. The octagon forms a lantern with 8 small gables each with a window. Originally each small gable had its own tiny finial above the window. The finials were removed; replaced in 1988, but have since been removed again. Other noteworthy features are the segmental-headed hooded dormer windows along the roof slopes. Along the front facade is a singular gabled dormer, which has a transom window above the main window in the same shape as the transom over the front door. At some time the interior ceilings were lowered but restored to 9′ height by Colin & Pauline Brown. 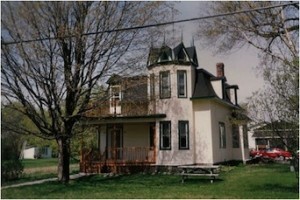 Post War photos show the top portion of the house covered by white shingles and the lower portion with red brick siding. The brick siding was replaced by blue siding and then, in 1988, with the current finish. Porches and verandas have all been replaced. Interview with Mrs. Pauline Brown. May 12, 2009. Riedel, Bonny, The Heritage of Goulbourn: A Driving Tour. Goulbourn Township Local Architectural Conservation Advisory Committee 1993. This entry was posted in Locations, Personalities and tagged House, store. Bookmark the permalink.